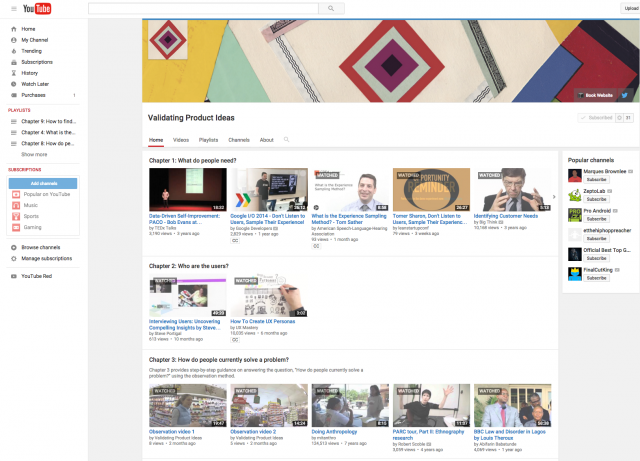 Validating Product Ideas’ YouTube channel begins to take shape & form. Subscribe! Listen to my 15-minute interview with Brad Feld (@bfeld) on empathy. Interview prepared by Daniel Szuc of Apogee Hong Kong (apogeehk.com) and yours truly. Full transcript available in the description. Let us know what you think! Listen to my 15-minute interview with Gary Vaynerchuk (@garyvee) on empathy. Interview prepared by Daniel Szuc of Apogee Hong Kong (apogeehk.com) and yours truly. Full transcript available in the description. Let us know what you think! “Validating Assumptions with Lean UX Research”, my full-day workshop is on Saturday, 10/25, 10am-6pm, at General Assembly NYC. During the workshop you’ll learn and practice Experience Sampling, Interviewing, and Field Observation to answer a real-life research question. No pre-requisites. The workshop is for product managers, startup founders, entrepreneurs and aspired entrepreneurs, marketers, biz devs, designers, researchers, you, you, and you. This is my Google I/O 2014 talk from last Wednesday. This talk will inspire developers to implement valid and reliable ways to answer their most burning questions. It’ll help them validate or invalidate their assumptions on their own—cheaply, and quickly, by using simple user research techniques with a main goal in mind: developing apps people need, want, and enjoy. First 30 minutes are the talk itself, the rest is Q&A. Watch my 24-minute Google for Entrepreneurs video class. Excellent for people who tend to ask others what they think about their startup idea. Female startup founder or investor? Help me with my book! My name is Tomer Sharon and I am a Senior User Experience Researcher at Google Search in New York City. I am also the author of the book, It’s Our Research: Getting stakeholder buy-in for user experience research projects (2012). I’m currently working on a new book, Lean User Research for Product Development, and I would like to ask for 10 minutes of your time to help with research for this book. My current research includes oh-too-many male respondents and I am eager to balance things to get better data. The book is for practitioners who take part in product development and don’t have too much training in, time, or budget for UX research. I teach my readers how to learn from their users quickly, cheaply, on their own. I provide step-by-step guidance through answering their most burning questions about their users with far-from-robust, quick-and-dirty research techniques anyone can apply. ***Female startup founders***: I would like to ask you a few questions about your startup and approach to customers. My goal here is learning from you. My intention is not in any way to judge the way you work or what you believe in. If you respond to the following questionnaire, you will be given credit as one of my book’s co-creators, if you’d like. If not, you can remain anonymous and all I’ll mention is that I spoke with a startup founder from <City, State, Country>. ***Female investors***: I would like to ask you a few questions about customer development among startups. It is important for me to say that my only intention is to learn from you toward a book I am currently writing. My intention is not in any way to judge the way you work or what you believe in. If you respond to the following questionnaire, you will be given credit as one of my book’s co-creators, if you’d like. If not, you can remain anonymous and all I’ll mention is that I spoke with a startup founder from <City, State, Country>. Please help me get the right data for my book. A full how-to guide including a template and example, by yours truly. My newest General Assembly class: Need to Know: Evaluating Startup Ideas, is offered for the first time on May 13, 2014, at 5:30pm in NYC. Many startups and businesses are being founded based on a hunch, a judgment call, incomplete information, and faith-based hallucinations — and most of them fail miserably. Startup founders and business owners only then ask themselves why. This class takes a different, risk-mitigating, more scientific approach to the art of starting a business. You’ll learn how to develop a product people really need by uncovering these needs well in advance. Before you write one line of code, before you hire a large team, before you take a big risk, you’ll learn how to evaluate if people need your product through three activities to learn from your future customers. Know what problems need to be solved. 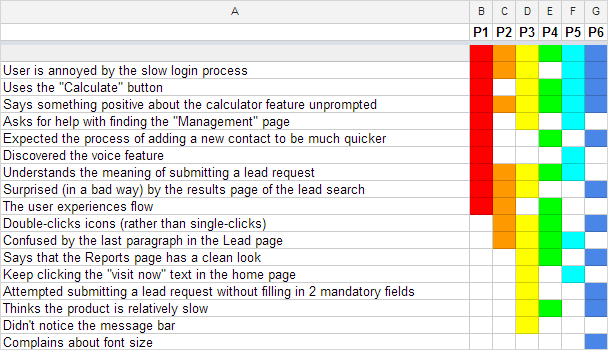 Find out what a landing-page test is good for. Gain a basic understanding of the Experience Sampling research technique. Discover the power of observation to understand human behavior. Be able to make sense of collected data to make an idea evaluation decision.